How the aftermath of tragedy launched a creative revolution. Harvard Medical School reports that every suicide leaves an estimated six or more “suicide survivors.” According to the latest Samaritans’ Suicide Statistics Report, 6,122 took their own lives in 2014 right here in the United Kingdom. That year alone, at least 36,732 people were suicide survivors coping with the emotional aftermath. I understand what this emotional aftermath feels like because in 2014, I was among them. After losing my mother to suicide that year, I had no idea how to cope. To make matters worse, I was an American who had recently moved to the U.K. and therefore I felt even more lost and alone. Suicide still bears a stigma. Those who experience this type of tragedy often describe a sense of socially imposed vulnerability or shame. As a result, this can prevent them from speaking up and sharing a difficult but incredibly important story about human life. Survivors of suicide often describe an experience of social isolation, prolonged grief, and powerlessness. Even though losing someone by suicide renders you the victim of an unexpected trauma, the pain is two-fold because often our society, even family and friends, inadvertently compound this pain by their reaction or lack of reaction. Uncomfortable or distant silences ultimately confirm our limited ability to engage as a community in such a sensitive subject. I have often felt like society’s modus operandi is silence and yet ironically, it is this very silence that destroys so many lives. We alienate the very people we often promise to protect. From a physical distance to avoiding the subject of suicide altogether, the distress can lead to a host of other issues from lapses in mental health, periods of self-harm and at worse, to the taking of one’s own life. According to the research findings of Crosby A.E. and Sacks J.J. (2002), those who experienced a loss by suicide were 1.6 times more likely to experience suicidal ideation, 2.9 times more likely to have a plan for suicide, and 3.7 times more likely to make an attempt at suicide within the first year following their loss. The Center for Disease Control in the U.S. reports that those under the age of 25 are at an even higher risk of a cluster suicide when they lose someone they love this way. Struggling with the loneliness and my own inability to understand why we still stigmatise issues like suicide and mental health led me to journalling. Initially, I found great comfort in the blank pages of my hard bound, A5 book where I kept a running commentary of how I felt each day. It felt safe and allowed me to express everything I wanted without the fear of being misunderstood, under pressure, or worse still — judged. There was so much to say and therefore I frantically wrote in a stream of consciousness style for days on end. However, after the first month of journalling in a seemingly inexhaustible state, I eventually hit a wall. There quickly came a point when I just stared at the pages with little more than a single word to write. Some days, the only thing I expressed was the word: NOTHING. I would write it again and again staring at these seven letters as if I might magically discover insight or inspiration. The emptiness devoured me but I simply couldn’t write what I knew I didn’t feel. In retrospect, that period of writing “nothing” revealed as much to me as the steadily expressed scribbles that I could hardly contain on other days. I learned that grief vacillates between a state of emptiness and a state of overload. Also, by sticking with the journalling process, my blank pages were eventually followed by far more refined insights. However, I would not have realised it the time. I would not have realised it without the space to be open to exploring the process. These very insights ultimately helped me to discover my voice and helped me challenge the same social views that once silenced me. The questions that no one asked me about my experience and its impact on my mental state, I began to ask myself. The few conversations that people reached out to have with me, I began to initiate with others instead. Even the bereavement journal that I hoped would have existed when I first lost my mother, I eventually committed to creating, crowdfunding, and publishing myself. This was the birth of the After Journal™. 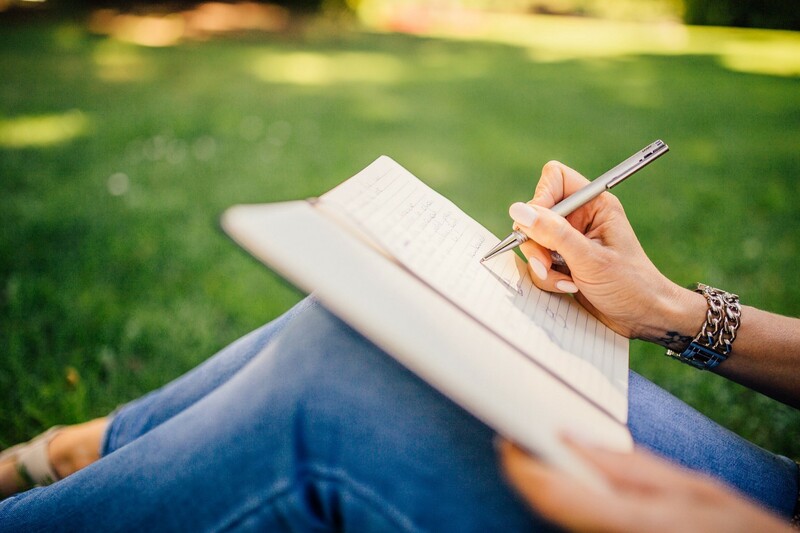 Journalling has the power to catapult us beyond the realm of social stigma because just as we release our complicated emotions onto a page, we gain a crucial vantage point in which to observe the many differing views we experience. This in turn, helps to clarify our own position. While it won’t ease the loneliness that can permeate our lives, it can help to carve a narrow but necessary passage through time enabling an imminent journey toward healing. If we recall that in 2014 at least 36,732 people were stranded in the aftermath of suicide, then how many more of us worldwide are continuing to encounter silence and feelings of powerlessness? This is why journalling can be life-transforming. The handwritten word is a powerful tool that not only helps us to heal while taking control of our own narrative, it ultimately empowers us to determine how we want our voices to be heard. Need to talk? In the UK, the Samaritans can be reached on 116.123 and the call is free. In the US, the National Suicide Prevention Hotline is 1.800.273.8255. For every After Journal sold, a special edition will be printed and donated to secondary schools throughout the U.K. in regions at an increased risk for suicide.